Jade best known for its gorgeous green color has been closely linked to Chinese civilization. The term jade encompasses two gems, nephrite and jadeite. The Chinese today pay handsome prices for high quality jade (jadeite) but, the history of jade in China began with nephrite and not jadeite. The sources for mining nephrite are many and exist in at least 6 to 7 countries but, jadeite is another story. The Kachin region in northern part of Burma is the only place where, commercial quantities of gem quality jadeite are mined. Nephrite has been known and used to make tools, jewelry and carvings for a few thousand years but, the Chinese adventure with jadeite is just around 3 centuries old. The price of the highest quality green jadeite has gone so very high today, that the finest pieces can be priced very close to natural diamonds. The Chinese attach special meaning to this gem, they believe that wearing it brings good luck and wealth, it also brings them in closer contact with heaven. So what does a casual buyer looking for a jade ring or pendant do, this presuming that he or she is not interested in imitations and fakes whether natural or man made. In this report we will talk about options and provide clear explanations, no quick sales talk but facts to help you understand and make the right buying decision. Our discussion will cover natural jade requirements that are within the 100 U.S$ per carat category, so we exclude the extravagantly priced material. If you have a requirement for the fine material in the 500 U.S$ to 2,000 U.S$ per carat category, email us with specific requirements and we will talk about GIA certified material. Affordable Natural Jade: All reference to jade on Kaisilver online resources refer to natural jade (jadeite and nephrite) unless specifically stated to be otherwise. 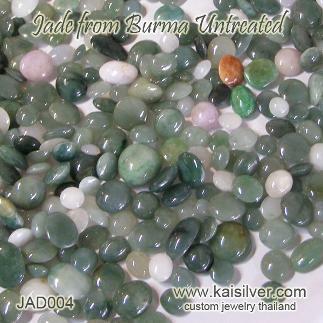 Our main focus is on jadeite from Burma, we generally source the affordable stones to make them affordable for a broad range of jade and gem lovers. Keep in mind that untreated jadeite can be affordable as long as, you do not insist on the finest color and translucence. Serious gem lovers often give importance to untreated gems even if, they do not happen to be the finest pieces. This works very well for jade buyers who buy and wear the gem, for its traditional customs and metaphysical beliefs. 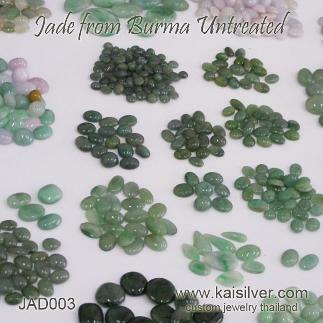 We also provide options for dyed jade gems that look gorgeous but, are treated to enhance their color and translucence. Clear disclosures are always provided regarding treatments applied. We refer to natural gems that fall within the 100 U.S$ per carat range as, being affordable natural jade. High Quality Natural Jade: It is jadeite gems that generally fall in this category, prices can rise up to 2,000 or even 2,500 U.S$ per carat. With our strategic working contacts at gem mining sites across the globe including Burma, we remain one of the most reliable sources for gem sourcing. Send us your requirements with as many details as possible and our team will, head straight to Burma and do the gem selection for you - it does not matter whether you need a single piece or a number of pieces. We will not sell such high priced items without GIA certification and will expect you to bear the cost of certification. We will need information about size, shape, color and even budget estimate for your requirements. Treatment Disclosure: Most gem lovers would prefer to wear gemstones that are natural and not enhanced in any way, this is obviously true of jade. Unfortunately, green jade with a good color, uniform color spread and significant translucence is very hard to find in natural form. With this being the case, fine untreated green jade is able to demand extremely high prices per carat - the price can often go near to that of fine rubies, sapphires and even diamonds. Most budgets cannot afford such high price points and have to make some decisions. You can choose untreated jade that is natural and beautiful in its own way but, does not match the finest jade gems. This is a great way to satisfy gem lovers who have a higher level of understanding related to natural gems. It is also works well for jade buyers who wish to wear the gem not only for its beauty but also, to derive benefits from metaphysical properties attributed to the gem. At Kaisilver we have special interest in sourcing natural jade gems that are gorgeous but affordable and more importantly, are not treated in any way. Having said that can easily procure both, dyed and fine quality imperial jade (untreated) if that is what you wish to have. Operating with complete transparency, we will always disclose if the jade that we provide you is treated by any method. Jade Gemstone Jewelry: Widely accepted as one of the most reliable sources for online custom made jewelry, we obviously prefer to make complete jewelry with gems of your choice. You can pick the design, gemstones and dimensions for your jade gemstone jewelry. Our support team will guide you regarding the quality, treatment and pricing of various jade gemstone options. Both gold and 925 silver custom jewelry is given the same attention and detailing related to workmanship. While you can email us images or sketches of your favorite jewels to be custom made, you could even pick any of the designs on our website and request for the piece to be made with jade. All design modifications can be accommodated. Kaisilver: As one of the earliest and highly trusted online source for fine custom made jewelry, we craft all types of high quality made to order jewels in gold and 925 sterling silver. You can send us your own design ideas or pick one from our website and request, for it to be made with metal and gems of your choice. Each gem that we use is handpicked and custom cut. We are closely networked to every gem mining source in the world and have preferential access to more than, 200 million carats of cut and polished gems. We therefore place no restriction on gem selection and ensure that, the gems we pick offer good value at each price point. Do get in touch with our experts at sales@kaisilver.com for any questions or requirements, related to jewelry and gemstones. 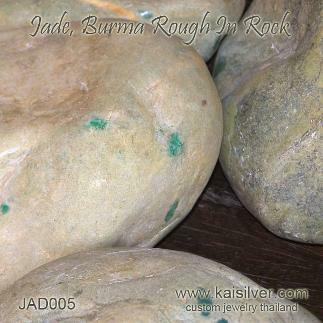 Burmese jade in rough form, the stone is embedded in the rock, dealers need to bid for each piece of rock without, getting the opportunity to see what is inside the rock. The pieces of jade that are naturally formed in the rock can be small or large, the quality and size is a gamble and the buyer has to bear all risks. A good choice if you wish to have a more saturated green color for your jade but, would like to remain within a moderate price range. 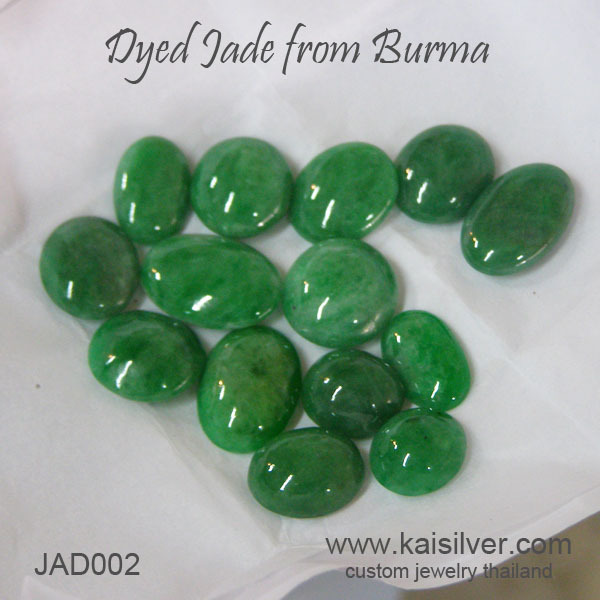 This is once again jade from Burma and is dyed in Burma, the gems have an expensive look but the color is enhanced by dyeing the gemstone. Sellers at times do not disclose treatments. 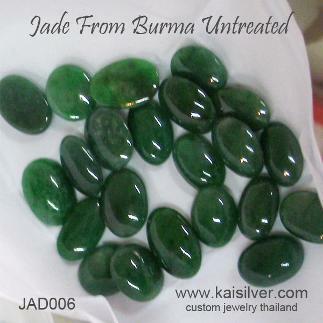 With men preferring dark saturated colors for their gems, these dark green untreated jade from Burma is a good option. The 20-30 pieces that seen in the image, were meticulously selected by Kaisilver gem sorters from a batch of more than 330 gems. The affordable price, makes them suitable for gold or silver jade rings for men. Not the finest of jade but for buyers who love untreated jade but do not have big budgets or for those of you, who wish to wear untreated jade for its metaphysical properties, these gems are a good buy at affordable prices. Most of these gems would be in the 10 U.S$ to 50 U.S$ per carat price range. 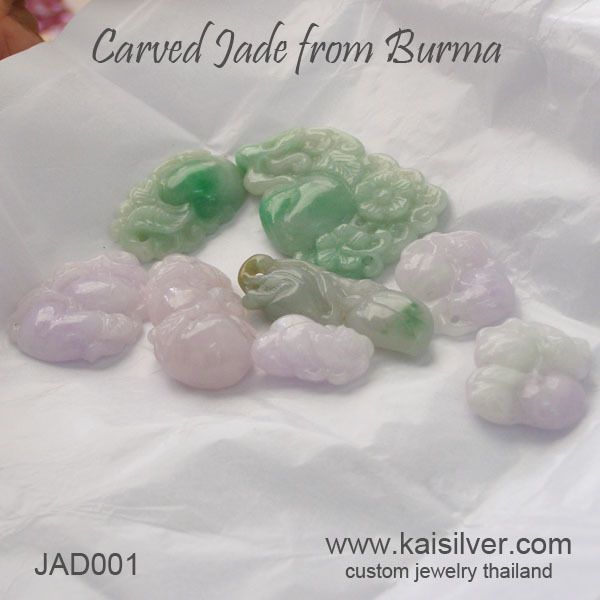 The well known Burmese jade carvings done using affordable untreated jade. The quality of the workmanship on these jade carvings from Burma is very close to what, you would find done on very high grade green jade gems. The designs are generally traditional, interesting flowers, dragons and snakes can occasionally befound. Buying a big batch of these untreated jade gems might get you a very attractive price but, less than 10% of the gems will actually make it to a Kaisilver jewel - the mixed quality once sorted, yields a very small portion of good jade gems. Notice that this lot of jade contains, white, pale green, dark green and lavendar jade.